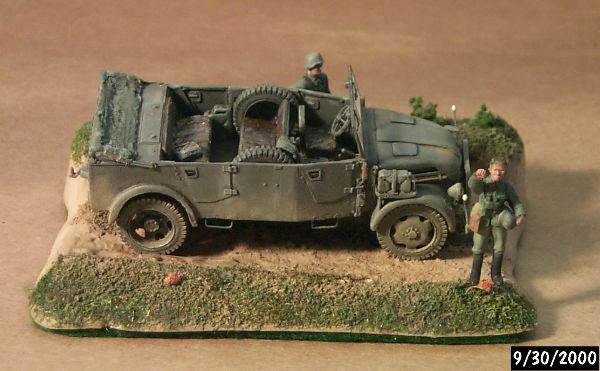 Attached is a photo of a recently completed 1/72 AL-BY Steyr 1500A/01 heavy 4x4 personnel car. (The A/01 indicates that the spare tires are stored inside the body). About 12,450 were produced by Steyr in Austria from 1941 to 1944. It sat eight and was powered by a V-8, 85 bhp, air cooled engine. Other versions included and ambulance and cargo truck (both also offered by AL-BY), and a command car. This personnel body could also be seen on the mercedes L1500A, and Phamomen Granit 1500A. The kit went together well. The major problem was a poor fit on the body with the front hood (bonnet) area, possibly due to shrinkage of the resin. Detail is superb and the parts delicate and strong. I recall only one small air bubble (maybe). I had little problem with breakage. The only things added was a clear winshield made from the box it comes in, wipers, and stowage inside. It was painted with Polly S panzer gray and highlighted with artist oils. The figures are ESCI. The base is scratch built from resin.